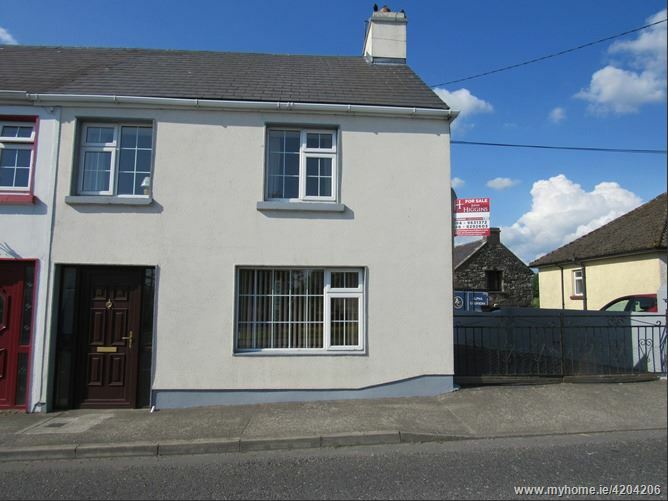 New to the market is this end of terrace townhouse centrally located in Ballyhaunis within walking distance of all town amenities to include church, shops, post office and schools. Accommodation extends to approx. 1,280 sq.ft and includes entrance hallway, sitting room, living room, open plan kitchen/dining area. Downstairs bedroom with en-suite bathroom, 3 upstairs bedrooms and main bathroom. There is a very decent garden to the rear with off-street parking to the side. The property is in excellent condition and represents an ideal investment or owner occupier opportunity. Viewing of this well presented property is highly recommended. Entrance hallway:	Timber floor throughout with a feature staircase. Sitting Room:	Timber floor with open fireplace. Living Room:	Timber floor with a solid fuel stove and fitted wall units. Kitchen/Dining:	Complete fitted kitchen with a tile floor and open plan dining area. Downstairs Bedroom:	Double bedroom with a timber floor and curtains. En-suite with tiled floor, walk in shower, toilet and wash hand basin. Bedroom 2:	Double bedroom with timber floor and fitted wardrobe. Bedroom 3:	Double bedroom with fitted wardrobe, curtains and carpet. Main Bathroom: Toilet, wash hand basin and bath. Bedroom 4:	Complete with carpet and curtains. Strictly by the joint agents, John Higgins auctioneer and Gerry Coffey auctioneer.